This second edition has been updated to reflect the demands of the Modern World History GCSE specifications. Combining lively narrative with an excellent range of written and visual sources, the book also contains features that aid students in their understanding of the topic and development of study skills. Is one of only a few books available on the topic at this level. 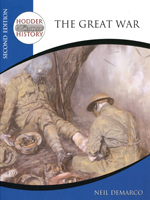 Provides complete coverage of the Great War content in the Modern World History specifications. Questions are completely revised to reflect current assessment practices.